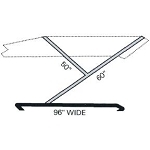 Bimini and Boat Top Frame Kits in a box come inclusive with all the hardware fittings and tubing needed for the DIY's to construct navy, bimini and pontoon canopies. Our products are built to last. Whether you’re looking for the perfect tool or materials, we have everything you need. Boat lovers can also rejoice, as we carry a wide range of Bimini hardware for any boat repairs that may need fixing before climbing in your boat. This hinge is made of highly polished 316 stainless steel. Easily remove or install bimini webbing straps with a push of a button. There are no screws or pins to be lost or misplaced because the stainless steel d-ring stays with the webbing. 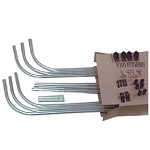 This kit is easily fitted to boats from 40" to 96" in beam. Made of bright anodized aluminum tubing to prevent oxidation. The design of the boat top allows for the center bows to be cut to fit width of small and large boats. The inserts to join the legs and the bows are permanently bent into the legs. This allows for easy connection of the three pieces. Fittings included. Kit includes: anodized aluminum tubing, 4 jaw slides, 2 angle deck hinges, 6 eye ends, 4 pad eyes, 4 webbing hooks, webbing, 6 bar joiners. This kit does not come with instruction and should not be purchase unless you are familiar with frame construction. 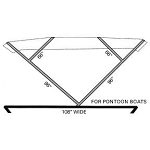 4-Bar Pontoon Bimini Frame Kit with Hardware. 1" x 1" x .062 wall thickness satin anodized square tubing, complete with black Delrin Nylon Fittings. Approximate height from the deck hinge is 66" with a 108" projection from bow to stern. Maximum width from port to starboard is 108", The frame can be cut to make it narrower and shorter from bow to stern. Kit includes: anodized aluminum tubing, 6 jaw slides, 2 angle deck hinges, 8 eye ends, 4 pad eyes, 4 webbing hooks, webbing, 8 bar joiners. This kit does not come with instruction and should not be purchase unless you are familiar with frame construction. We’ll always do our best to make every order and request we receive to be accurate and complete. It’s our mission to make sure we carry only the best products by well-known and respected manufacturers. JT's Outdoor Fabrics Inc. pledges to provide the best service possible, and to fill all received orders as accurately as possible. If any item is on backorder and is expected to arrive within 5 business days, we will ship it complete so you don't have to pay twice for shipping. Should you, for any reason, not be satisfied with your purchased items, let us know right away so we can correct it for you! If you can’t get to our store in Barrie, you can also browse our selection and shop online. If you have any questions about the products we offer, give our knowledgeable staff a call at 1-877-780-2722. We can answer any inquiries you have about shipping, returns, warranties, and fabrics or tools. Shipping Bimini hardware from our warehouse is usually the next day as long as the item is in stock but we advertise 2 days to give us some leeway for unpredictable busy days. Weekends and Canadian holidays are excluded. Canada Post can be any where from 1 to 5 days depending where you are in the country. If your postal code ends with a zero it will be at least 3 days. UPS can be the next day or 3 depending on which service you pick. Keep in mind days exclude weekends and Canadian Holidays. We are a solid brick and mortar business located 45 minutes north from Toronto. We opened our doors in October 2014 and have been providing excellent service to our customers ever since. We are a major distributor of textiles and upholstery supplies with a strong focus on those who like to “do it yourself”. From your home to your boat to your car, to your outdoor vehicles we’ve got you covered. Carrying 100s of colours and varieties of Sunbrella® fabrics to choose from, a wide assortment of vinyl’s with any and all of the tools and products to help you do it yourself, JT’s Outdoor Fabrics is a one-stop shopping experience.